MIA VON MINK CLUTCH GIVEAWAY! CONTEST IS NOW CLOSED. WINNER WILL BE ANNOUNCED 12/17. THANKS TO ALL WHO PARTICIPATED! STEP TWO: Visit Mia Von Mink's shop, check out her awesome stuff, and post a comment below telling me which item is your favorite. "I just entered to win a Mia Von Mink clutch on Le Magnifique! Enter to win here: http://su.pr/2NbxSz"
(You must tag Le Magnifique for your entry to count - place the "@" symbol in front of "Le Magnifique" and use the right arrow key to scroll through until you get to our FB page, then hit enter). FOR AN EXTRA ENTRY: Subscribe by email to receive blog updates straight to your inbox (your email will not be shared, I promise). Post a second comment below to let me know you subscribed. Contest begins tonight (12/8/11) and will end on Thursday, December 15th at 11:59pm PST. Winner will be selected at random and announced on Saturday, 12/17. This clutch is 5 inches tall and 8 inches wide. Purse come with an easy to attach short chain and long chain. 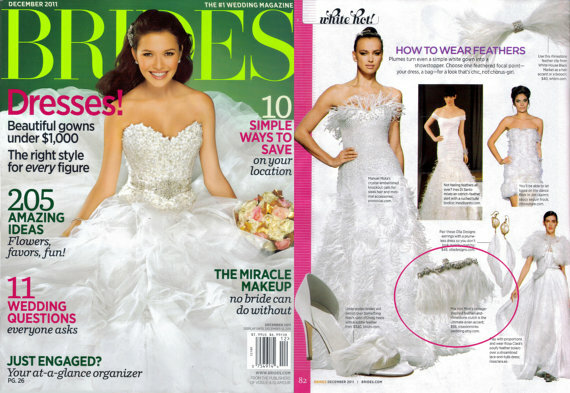 Mia Von Mink was featured on December's issue of BRIDES magazine. Awesome, right?! LUSH Floral Rhinestone and White Goose Feather Bangle Purse Clutch!!! Love the Black STARLET Feather and Rhinestone Bridal Clutch Purse! Thanks! I love the JULIET Rhinestone and Silk Ribbon Necklace! Gorgeous! I subscibed! "I just entered to win a Mia Von Mink clutch on Le Magnifique! Enter to win here: http://su.pr/2NbxSz"